Watch the experts use professional hair care accessories and learn how to do it for yourself. All products shown are available in our online shop meaning you can be inspired, then purchase your chosen professional hair care accessories in a few easy steps! This 80’s style is making a comeback and it’s easier to perfect than ever! Style Ambassador Stacey McCormack shows you how to perfect a luscious set of curls guaranteed to be the talk of any Xmas Party. 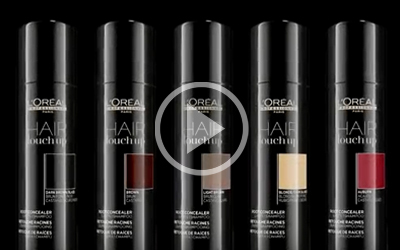 Watch this video on using Hair Touch-Up. Instant root fix in between salon visits to cover grays and last 1 shampoo. Make tonight your night with a show stopper updo hairstyle. Create this romantic updo for your New Years Eve Party with L’Oréal Spray and Mousse.